So, why did Mid-Market become the way it is? Mid-Market has been in limbo since the 1950s. When the BART was ripped up, it drove away business. Other social challenges have been overlayed, but the lack of businesses has been a key in keeping it the way it was. Less commerce leads to less foot-traffic, fewer employment opportunities, and less interest from the outside. Its a shame, because it truly is the center of San Francisco. When you type in San Francisco on Google maps, its right at Van Ness and Market, dead center. You can see tourists stumbling through the vacant hole that is 5th-7th, looking for some sign of welcoming presence, but not finding any until they hit Westfield mall. What is SQFT and how is it making an impact in the area? SQFT is a platform that connects retail entrepreneurs with vacant and underutilized spaces. Really it’s a group of four hardworking people (Bonnie, Emily, Tina, Patrick), with a very encouraging community of support. Our longer term vision is to make it easier for budding entrepreneurs to secure space in the city, bolster the local economy, create new job opportunities and bring more vibrancy into underserved neighborhoods. 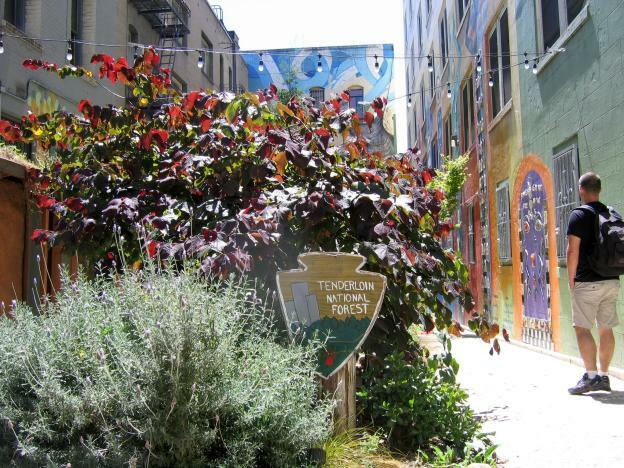 In the short term, we’re supporting the city’s Mid-Market revitalization efforts. How can we work together on rejuvenating Mid-Market without displacing the current locale? We don’t just want people to walk by, we want them to engage with the neighborhood. It’s essential the existing community plays an active role in rejuvenating the neighborhood. The platform we’re building is not only a place to rent space, but also a way to hire local labor to help entrepreneurs mind their stores, promote their event, check IDs, or even cook and serve food. Space is nothing without the people behind it, around it, in it. We’re not just selling square feet, but that space is a starting point to connect business, labor, and the community. What are some of the benefits for new startups looking to move into the area? Clearly that question is something to ask Twitter, Zendesk, One Kings Lane, and all the others already moving there. There’s a tax incentive, but also, I believe that startups are realizing that value comes, not from coding something magical in a basement in Palo Alto, but from being part of a creative community. You’re holding a pop-up this Wednesday, what kind of cool stuff will be happening? On Wednesday, August 1st, SQFT is demonstrating the power of the pop-up in Mid-Market, San Francisco. Various locations along Market Street from 5th to 7th Street will be opening up their doors to new ideas and curious people like the readers of The Fetch. Accordion Cafe Stop over on your bike commute for free bike repairs at Huckleberry Bicycles and grab some delicious De La Paz coffee. There will be an accompanying accordion player! Game Night Get your game (and drink) on with a fun game night — think giant Jenga, Tic Tac Toe and Ring Toss! What are some other Mid-Market initiatives worth checking out? So much is going on in Mid-Market. I’m new to the area myself, and just amazed by the energy and enthusiasm to contribute. Speaking with people who have been around for decades, you get the sense there is reason to be skeptical about five year plans, but everyone has been really excited and helpful. So specific initiatives include: The ARTery project, 5M project, Intersection for the Arts, A Temporary Offering, FoodLab, Holy Stitch, The Luggage Store, The Tenderloin National Forest, The Huckleberry Bicycles Newsstand, Luca’s Newsstand, So You Think You Can Paint. There’s a great calendar here http://centralmarketpartnership.org/events, and there’s usually something interesting here http://atemporaryoffering.com. Which other events do you guys attend in SF and where do you go for your SF news? I basically say yes to every event I get. FOMO is a serious epidemic in this city. I usually end up going to one thing and just rushing around too much. Recently I’ve been choosing only one thing per night, and I recommend checking out American Tripps Ping Pong, A show at the Orpheum, A drink a Ma’velous, Lunch at FoodLab, Chess on Market, A visit to the library, board games with friends… oh wait, I’m describing our event. Seriously though, I haven’t been getting out thanks to all the cutting and pasting involved in preparing for Wednesday.